We have the largest stock of backup pads in North America. Pads are available in over 250 configurations. If you don't see what you want, contact us. This page shows are most popular DA pads for hook & loop (H&L) and surface conditioning SCD discs, H&L discs. Pads are available with and without vacuum holes. All of our DA pads have a 5/16-24 male arbor. The pads have a hook face for holding discs with a loop back. If you do not see the pad you need contact us. Medium flex tapered edge pads for H&L discs. 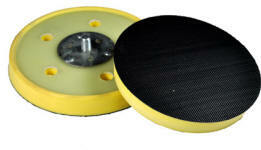 These are 1/4" thick molded pads with a fiberglass back plate. Soft flex tapered edge pads for H&L discs. 3/8" thick molded with a fiberglass back plate. Low profile style DA pad for H&L discs. Molded with a fiberglass back plate. Click here to enter shopping cart list for these pads.